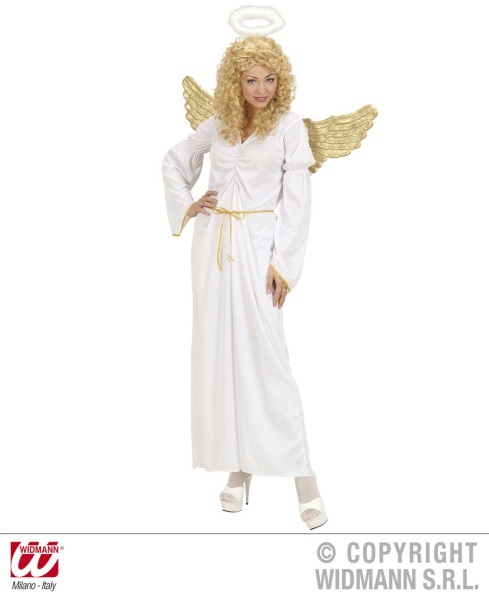 The Angel costume comprises a dress, halo, belt and wings. The dress is made of a smooth and white flowing material, and features interesting ruffling at the chest and on the sleeves. In addition its sleeves are flared, and finished with a decorative golden trim. Because the dress’s material is quite stretchy, it matches itself to the wearer’s figure. The set includes a soft and shining gold-coloured belt. The halo is made of white down, and is worn on the head like a headband. The wings are made of pliable plastic, meaning that they can be carried around without having to worry about them. The wings are gold coloured, and have a span of 34.5" (88 cm). This costume is available in the following sizes: S (5'5"-5'7"/165-170 cm), M (5'7"-5'9"/170-175 cm) and L (5'8"-5'10"/173-178 cm); for details, see the Measurements chart. Any Angel in this costume will be particularly charming! NB: the set does not include the wig shown in the photo.